To avoid delays and extra cost that are likely to arise if unforseen ground conditions are encountered during construction. To enable prediction of the behaviour of the ground in response to the planned engineering changes (such as excavations or increased loads from foundations or earthworks). Predictions of ground behaviour are an essential part of geotechnical design; get your understanding of the ground wrong and your design for the geotechnical works is likely to be inappropriate, possibly leading to the need to re-design during construction with consequent disruption to the project programme. The scope of the site investigation required is very dependent upon the geology as well as the proposed project. For instance the ground investigation strategy used for sites with laterally uniform soils is very different to that used for sites with complex geology. Gabriel GeoConsulting use specialist geological knowledge to ensure that the ground investigation strategy is appropriate to the situation. Keith Gabriel has particularly extensive experience of the Wadhurst Clay and the solifluction processes which have critically altered the properties of near-surface layers of clays in southern England. An overview of the significance of solifluction processes is presented below. The Wadhurst Clay is an over-consolidated silty clay which was deposited in a coastal mudplain environment. The clays contain a variety of siltstone, sandstone and limestone horizons many of which were deposited as lenses or channel fill deposits so are typically of limited lateral continuity. These rock units may be iron-rich and generally have high strengths. The Wadhurst Clay was particularly susceptible to re-working near surface by the processes of cryoturbation and solifluction under periglacial climatic conditions which affected south east England during the Pleistocene Ice Age. 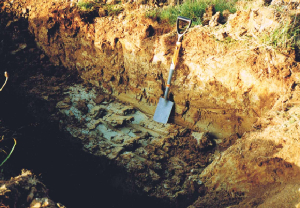 Cryoturbation, which is the cyclical freezing and thawing of the upper soil layers, caused physical disruption of the soil fabric in the weathered and otherwise unweathered Wadhurst Clays. Cryoturbation effects may extend to depths of up to five or six metres below natural ground level and in some instances have also been shown to have induced shear surfaces aligned broadly parallel with the ground surface. The solifluction process involves the movement downslope of saturated soil over frozen ground at depth thereby creating extensive, broadly slope-parallel slip surfaces towards the base of each solifluction lobe or sheet. The solifluction process also typically led to intense fissuring within the soliflucted clays. Solifluction movements were able to take place on very shallow slopes owing to the development of high pore water pressures when the ground surface froze. 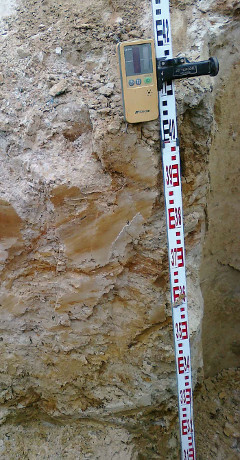 Fluctuating climatic conditions in the Pleistocene allowed several phases of solifluction to occur such that more than one solifluction sheet may still be identified in some areas. The total depth of solifluction deposits is typically between 1.0m and 3.0m but does occasionally exceed 3.0m. Conversely, some Wadhurst Clay slopes are completely devoid of solifluction deposits. Solifluction deposits are particularly well developed in the area where the ice sheets never reached, which is usually considered to be south of a line between Bristol and the Thames estuary, and hence where the solifluction process was able to operate for a prolonged period of time. Since the end of the Pleistocene, approximately 10,000 years ago, the soliflucted slopes have generally re-graded to a condition which is stable in the summer months but, when pore water pressures rise in winter, becomes marginally unstable such that small downslope creep movements may occur on the slip surfaces. Any artificial disturbance of these slopes such as the addition of fill material on the upper parts of the slope or excavations into the lower parts of the slope, or even the removal of trees, can lead to instability during subsequent wet winters.